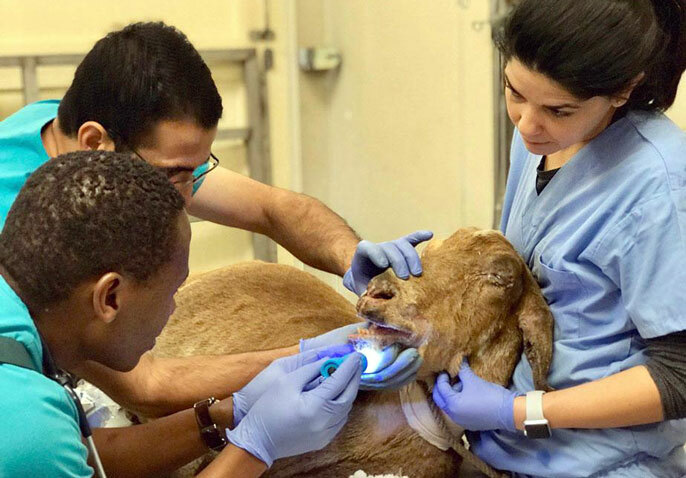 Veterinarians Munashe Chigerwe, left foreground, and Muzafar Makhdoomi, rear, examine Louie the goat for mouth and tongue damage. Fourth-year veterinary student Jamie Sherman assists. UC Davis fire crew and a veterinary team spent the long weekend hard at work at the Camp Fire, while back on campus, other firefighters ran a relief effort for the fire victims, and veterinary staff tended to animals brought in from the fire zone. Feather recovers in her stall.